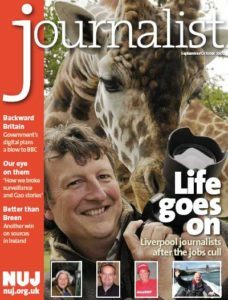 Members of the NUJ have voted for Christine Buckley to become the next editor of the Journalist, the NUJ’s membership magazine. A total of eight candidates stood in the ballot. It was the first time the role has been open in more than two decades. Christine Buckley will be taking over the post from Tim Gopsill, who is retiring from the role after 21 years in the editor’s chair. She won almost half the valid votes cast. However, turnout was low at 4,807 out of a union membership of around 37,000 despite controversy flaring in the run-up to the ballot. One candidate, Mark Watts, accused another, Rich Simcox, of not declaring his affiliation to the NUJ Left group. NUJ Left is accused by some of seeking undue influence over the union leadership. Supporters say it is open about its work and its aims are benign. However, neither man did well in the poll: Watts is reported by blogger Jon Slattery to have come third and Simcox, who had backing from many senior figures in the union, was seventh. Christine Buckley started her career on local papers before moving to work on UK national titles. Until recently she was the industrial editor on the Times. She was congratulated by the NUJ General Secretary, Jeremy Dear, who welcomed her to the union’s annual conference, ADM in Southport on Friday, November 20. Jeremy Dear said: “I congratulate Christine on her election win and am very much looking forward to working with her. Speaking in Journalism.co.uk’s forum last month, Buckley said: “The NUJ is a strong, campaigning union and its communications need to reflect that, showcasing the union’s work across all sectors not just the traditionally organised ones of newspapers and broadcast. We also need to reflect what is important in freelance journalism, publishing, magazines and public relations. “There is a lot that could be done with the Journalist. Budget constraints have cut its publication down to six issues a year which is not great. It may be that resources just don’t allow that to change at the moment. But the magazine should certainly be improved. On his blog, Simcox congratulated Buckley for her victory. He said: “This is a real mandate and she clearly has broad support among NUJ members – exactly what our union needs. Buckley was expected to be confirmed in her post by the union’s National Executive Committee on 18 November. An attempt by the NUJ’s Birmingham and Coventry branch to call for a re-ballot at ADM failed. The branch said there should be no more than four candidates for the editorship and all should be experienced editors and managers. However the motion was ruled out of order and was not debated. ADM took place from November 19-22 in Southport.